Where did the OVERHAND puzzle come from? ^ Call it the SHEEPSHANK puzzle (4/1/04). Is there video of that episode? I love seasons 21 and 22 (esp. 22) BTW. I don't know of any video, but what was written is that the contestant pronounced SHEEPSHANK as "sheep's hank". WARNING: Lots of quoting, mainly because people can't bother to read the frickin' rules (or read them and deliberately ignored them). [Julian] calls it a positive learning experience and told me he doesn't regret a thing. Of course he doesn't -- his mistakes got him 15 minutes of fame. It also cost him over $50,000, but that's clearly not as important. And Julian, once you say anything after "I think I made a mistake..." makes you wrong. "I didn't feel like I made a mistake, but I feel like-I mean, I had solved the puzzle entirely and...really all I had to do was read it, and...I just went for it and I did my best." Julian, if you ever read this during or after your 15 minutes of fame, solving is not filling in the puzzle entirely. Solving is giving the solution to the puzzle using commonly-accepted pronunciation of said words, unless the judges determine otherwise. For all the vitriol I've thrown at Wheel since late 2010, they were right and you were what you were several times that night -- wrong. Pat appeared on a radio show today and of course was asked about this. He basically says everything that we've been saying, plus noting how the MDW is not literally $1M (which also fooled the host). Very well said regarding everything, especially about how you can't give in to "Give it to him!". I wouldn't expect anything less from Powerhouse, who also mentions something like what I've been saying regarding social media. I think the media knows all of this, but it brings in ratings to be divisive and accusatory rather than being thoughtful and meticulous. Pretty much what I've been saying since SEVEN SWANS A-SWIMMING. I'm of the theory that Wheel takes any publicity it can get, good or bad. The ever-looming threat of the point-and-laugh treatment by social media also presents the possibility that some players may end up intentionally screwing up like this to get their 15 minutes of fame with the "OMG HE LOST A MILLIUN BUX GIVE HIM TEH MONE" media -- Julian and Paul (the CORNO CURRO guy) both got interviews about mistakes that were their fault, even though I'm sure their mistakes weren't intentional. Well the thing is, Julian and Paul accepted their mistakes. So did Renee. This has apparently been floating around circles at Indiana U. Proud of him for getting on Wheel? That's good. And the fact that he still won, of course. 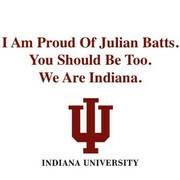 People think Julian'smistake misrepresented Indiana Univ., but IU has proved them WRONG! At least they're circling the wagon for him. You do something viral, and I'm sure having the school going against you would be a lonely feeling. You know, I just noticed something...if Wheel hadn't retired the Jackpot wedge this season, Julian would have also blown a $12,300 Jackpot, as he was on the red $700 when he filled in the puzzle (though that's assuming they still would have moved the MDW to the pink $500 even if they kept Jackpot).